Thanks to the kindness of the National Park Service, I was given a key and access to a 4WD dirt road that wraps around El Capitan in the Guadalupe Mountains. From this perspective, I’d hoped to capture a colorful sunset. Instead, I was initially disappointed to find clouds moving across the mountain range. However, lightening made the evening a little more interesting. 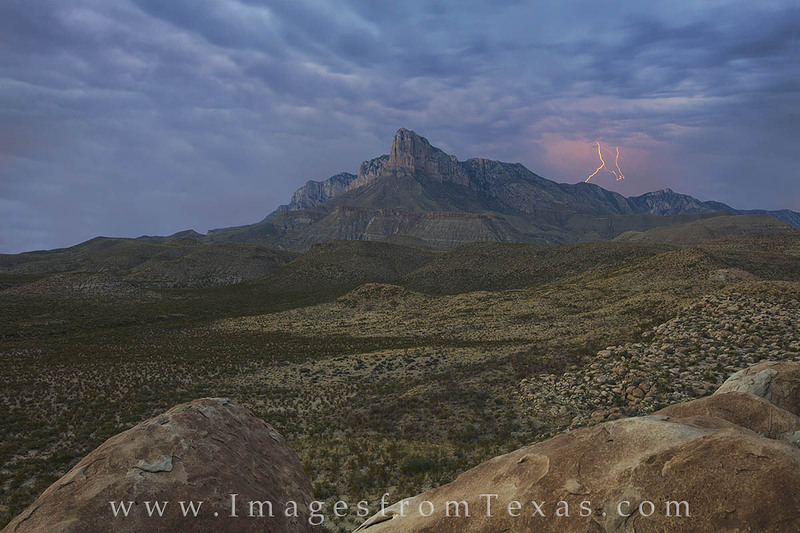 I took nearly 500 images from my vantage point on a rock outcrop about 5 miles from the Guadalupe Peak (not seen here as it rests behind El Capitan) as I let my cameral roll, hoping to capture lightening in a photograph. This scene was my favorite of the bunch. Later, the clouds would move by and a quickly fading colorful sunset took its place. Photo © copyright by Rob Greebon.